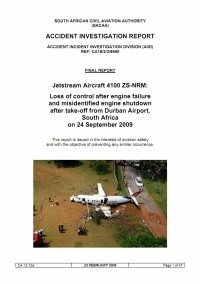 Investigators of the South African CAA released the final report of their investigation into the cause of a September 2009 fatal accident involving a Jetstream 41 twin turboprop airplane at Durban. The aircraft commenced its take off roll from runway 06 at Durban (DUR) and shortly before it became airborne a catastrophic failure occurred in the nr.2 (right hand) engine due to a fatigue failure of the second stage rotating air seal. It continued to climb to an altitude of about 500 feet AMSL. Immediately after raising the undercarriage, the nr.1 (left hand) engine spooled down from 100% to zero within seven seconds. The aircraft then descended and the stick shaker activated. The airplane force landed in a small field and skidded before coming to rest with the fuselage broken in two and detached from the wings. Engine failure after takeoff followed by inappropriate crew response, resulting in the loss of both lateral and directional control, the misidentification of the failed engine, and subsequent shutdown of the remaining serviceable engine. The crew’s failure to follow the correct after take-off engine failure procedures as prescribed in the aircraft’s flight manual.